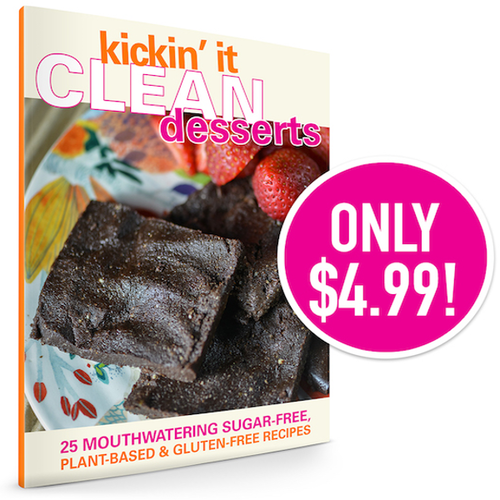 I HAVE A TREAT FOR YOU… the new Kickin’ It Clean Desserts eBook is here! I’ve been collecting and preparing clean versions of desserts for years and I decided to put them in one easy place. That really was the crack that let the first rays of sun back into my clean eating world. It was doable and so delicious. What I liked best was it turned something ‘bad’ like snacking, into a ‘good’ eating habit. Now you just need to create that dessert supplement. I know you have dessert type foods on your blog – but gurrrl I need a 25 healthy sweet tooth/chocolate list. I love to bake and having dessert after a meal or for a treat. But I need your magic dust on that food category. Most of the other raw/vegan/gluten free bakers out there make it so complicated. Random ingredients that I’ll NEVER use again or that I’d like to leave out entirely. Huge lists of ingredients. Complicated roadblocks like “Soak overnight” or “dehydrate for 24 hours”. Ain’t nobody got time for that… ~ Deanna T.
Kickin’ It Clean Desserts contains my popular collection of clean, plant-based, processed sugar- free and flour –free, gluten –free and dairy-free desserts. And there is no soaking overnight or dehydrating involved. Even some recipes have only 3 ingredients! You can make matcha balls, “milk”shakes, cupcakes , brownies and sorbet… the list is endless. Clean doesn’t mean you can’t have wine with your girlfriends or cake at that party. Life would be boring! Clean consists of eating real, whole foods, more plants, and gluten-free products. And for the sweet stuff, natural sweeteners are the bomb! the GLOW…the more natural ingredients, whole foods, and baking at home you do, the more you shine! As you weed out ingredients that cause inflammation and your blood sugar to spike, you’ll see a boost in your metabolism and notice blood sugar levels becoming more stable. No more sugar crashes and hangovers! Thank you Lisa for your Raw Brownie recipe. I made them for my birthday treat today. They are very rich and yummy! ~ Lori H.
The Raw Strawberry Oat Bars are divine!! I can easily eat the whole pan. It’s a guilt-free treat that’s super easy to make! ~ Billie G.
P.S. 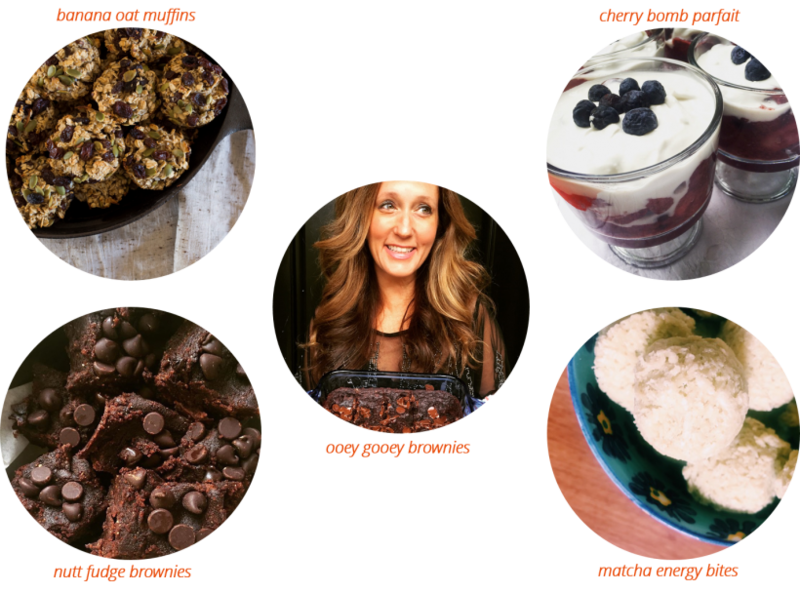 Kickin’ It Clean Desserts is a way to connect with that gorgeous body of yours. When you omit processed flours and sugars from baking, you feel lighter, energized and glow from the inside out. P.P.S. Every time I think of desserts, I not only think of YUMMO sweet treats but one of my fave hip hop songs, Whatcha gon do with that Dessert by Dawin . Yes, I’m a soccer mom who loves to rap battle!